I've previously written a series of articles covering PlayingCardDecks.com (see the first here), which is a growing online retail operation that sells a large inventory of custom playing cards, and is run by magician Will Roya. And by "large", I mean an inventory that includes literally 10,000s of decks in stock at any given moment, with 1500 different decks as part of their remarkable range! Here's Will with his daughter Chloe, as part of their first live show that they broadcast recently on Facebook (see it here). In this video they show some of the new decks they've got in stock, and they hope it is something that will become a regular feature for them. As you can tell, Will is a family man as well as a businessman. But he is also very ambitious. Not only has he undertaken the challenge of building up a successful online sales platform, he's also applied his passion for playing cards by being involved in producing playing cards himself, with the help of crowdfunding. This requires huge commitment and effort, as anyone who has been involved in Kickstarter will know. 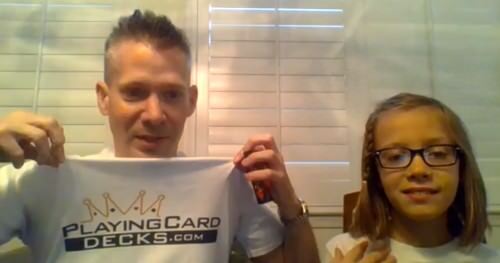 But he's been able to pull it off so far, running and growing his business while at the same time successfully producing several playing card projects. These include the Alice in Wonderland and Runic Royalty decks (reviewed here); and more recently the Chicken deck, Friendly Felines deck, The Guard deck, as collaborations that produced the Freedom and Opulent decks (all reviewed here). In this article I'll be covering some of the newest additions to the ranks of the PlayingCardDecks produced stable, and with these novel decks we'll meet armoured knights, classic monsters, and a whole lot of gold foil bling! Ever since I first learned about it in history classes in school, I've always been fascinated by the medieval world and everything related to it. Even now I still enjoy reading books which are set in this era, and artwork or stories that depict it. Clearly I'm not the only one with a fondness for the medieval, as is evident from the custom Knights deck that was designed by award winning UK artist Sam Hayles with the assistance of Will Roya from PlayingCardDecks. The Knights deck was produced by USPCC in their classic air cushion finish, to ensure that this deck not only has the look of quality, but also handles well. It is certainly an attractive and engaging custom deck that is still very practical, and that makes it an ideal workhorse for a magician, or even a great novelty to use for playing poker or other card games. 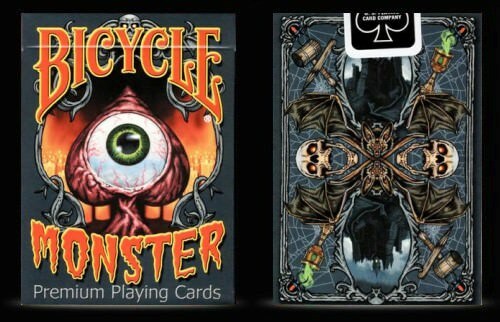 The Monster deck is described as "a new spooky deck of your favorite classic monsters in a fun cartoon style." This deck was designed by Arizona illustrator and artist Joe Ruiz, who was trained at the San Francisco Art Institute of California, and has been involved with artwork for projects that include children's books, logos, medical manuals, product packaging, humorous literature, and textbook art. This is his first playing card design, and if this debut is any indication, he's has real promise! Halloween has always generated a legion of associated products, and the Monster Deck is geared to fit within that stereotypical mould. Trick or Treat? In this case, the tricks are a treat, because the artwork is inspired by classic monsters from popular stories and myths, while still retaining a cartoon look that prevents it from feeling too dark. 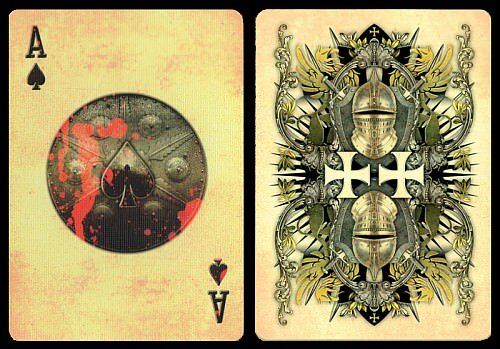 The tuck box features the artwork from the Ace of Spades on the front, while the reverse side showcases the artwork from the card backs. 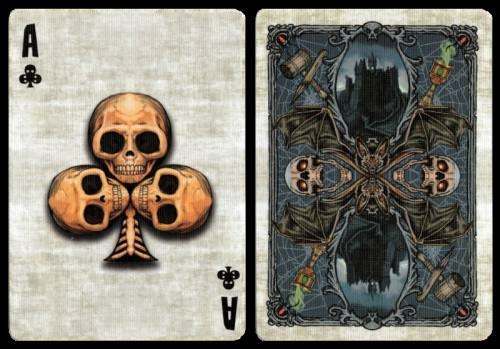 The card backs incorporate the kinds of objects that you'd typically associate with Halloween, such as skulls and bat-wings, and there's considerable detail here to study and enjoy. 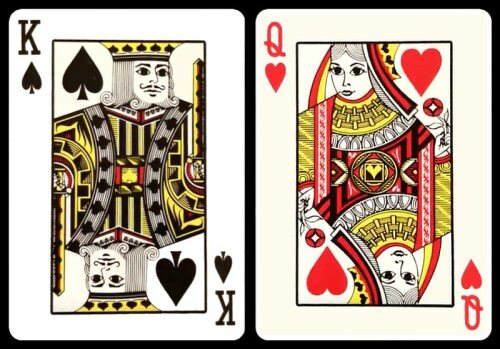 All the Aces feature a detailed oversized image in the shape corresponding to the suit pip. Besides the skulls shown here that have been arranged in the shape of a Club pip, there's also an eye-ball Spade pip, and a heart shaped Heart, for example. But the court cards are really the highlight of the deck, since they feature the monsters that this deck is named after. Instead of the usual royal characters we've come to expect on court cards, a selection of monsters, creatures, and mythical beings have crawled out of books, films and nightmares. 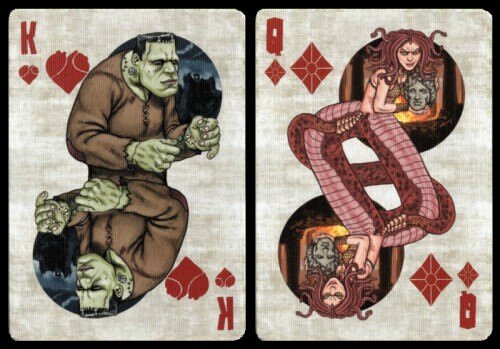 Each card depicts a different classic monster. The pips are heavily customized, reprising the oversized and more detailed image on the corresponding Aces, but in miniature. They especially look good against the backdrop of the grey stone-like artwork used on the faces of the cards. 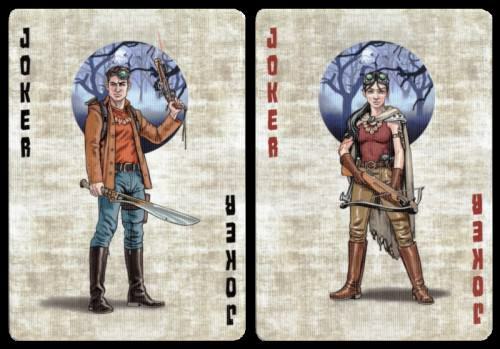 But where there are Monsters, there are also Monster Hunters, and these are depicted on the two Jokers. 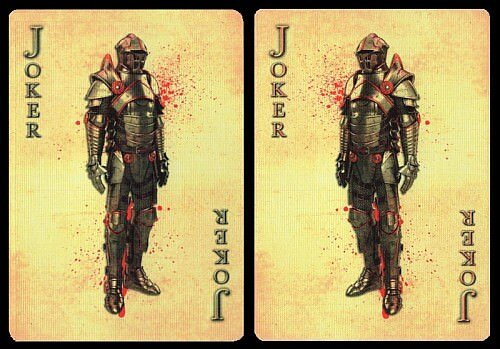 Since this is a USPCC printed deck, there are two additional cards, which are both additional King of Spades. 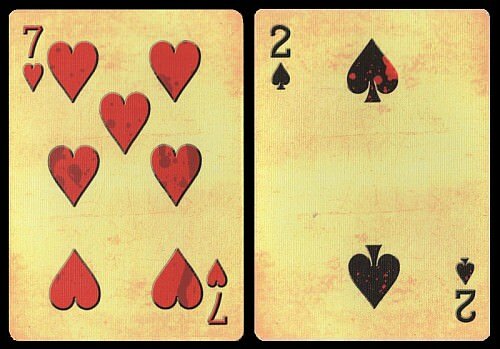 These depict the two stages of a human transitioning towards the Werewolf that is the official King of Spades in the deck. This is a nice idea and can be used for some clever colour changes - see here for a hilarious video by Yoav Yardeny with a fun performance that was inspired by and uses these gaffs. A deck with this kind of artwork won't be to everyone's taste, but it has already proved a winner to those who enjoy Halloween associated artwork. It's particularly ideal for use in magic tricks with a spooky theme. As you'd expect from a Bicycle deck, the cards handle smoothly and cleanly, so it lives up to the kind of quality we'd insist on for a custom deck like this. The Royal Vortex deck is a very special deck, because was created to help mark the first anniversary of PlayingCardDecks in April this year. This special promotional deck was made in a super limited print run of only 500 units. It was a special "mystery deck" reward that was first offered to supporters who participated in the launch of the Pip Box Club (a monthly subscription service which gives members an opportunity to get decks, samples, and more, at a discounted rate), but is now available for separate purchase. 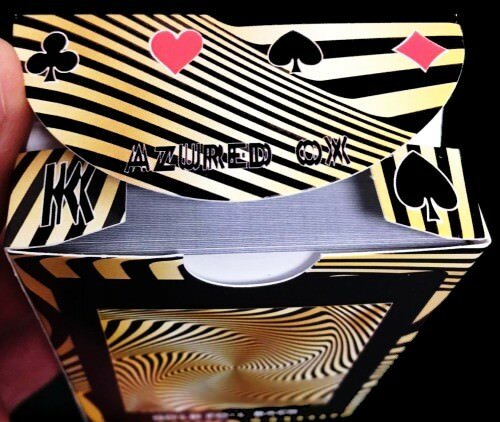 The deck immediately impresses with its custom tuck box, which has artwork that is deliberately designed to give the impression of an optical illusion, with mis-shaped letters that look like they are distorted and warped in a psychedelic fashion. 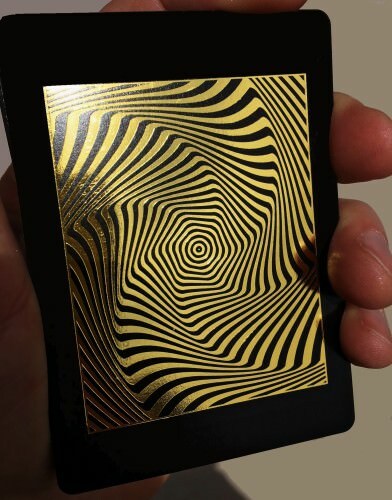 It also introduces the gold and black colour scheme that is the most striking feature of this deck, especially on the card backs. 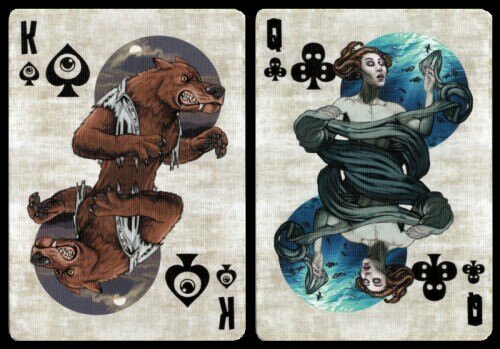 The artist of this deck goes by the name Azured Ox, who also created the Friendly Felines deck. 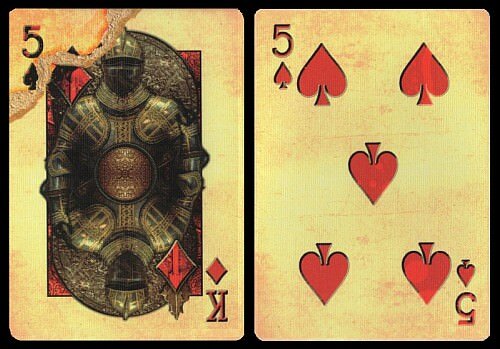 You'll see Azured Ox noted on the tuck flap, along with a King of Spades card reveal. The card faces are standard, but that's not why we came to this deck in the first place - we want to see the card backs! 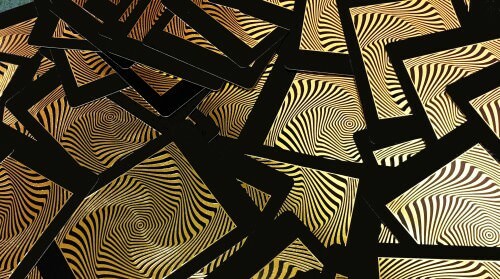 These are filled with striking gold foil, and the eye-catching nature of these is amplified further by the intriguing graphic design, which is geared to draw you in and bend your mind with a vortex shaped pattern that creates a kind of optical illusion and can look as if it is moving. I would have preferred to have borders that were similar in size on all sides, but there's no doubt that this is a card back that will get attention! This special collector's deck was printed by Gemaco. 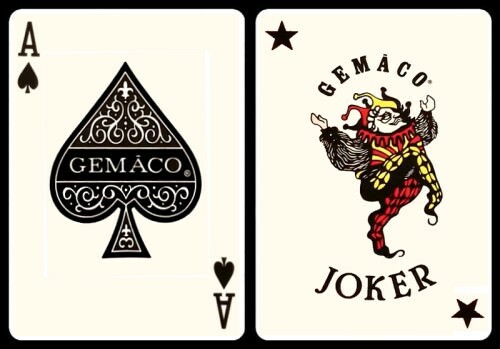 As a result, the faces all have the standard Gemaco artwork, including an attractive oversized pip on the Ace of Spades, and two Gemaco Jokers (one in colour, the other in black and white). 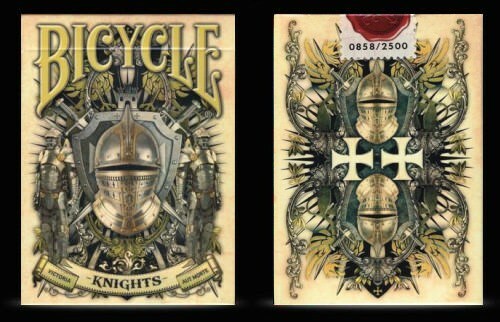 But that doesn't make the face cards uninteresting, because the court cards do have quite a different look from the standard Bicycle ones. I find them quite appealing, while still having a classic look. 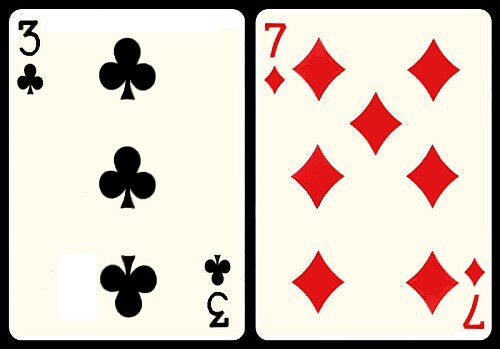 The number cards look quite traditional, and no short cuts have been taken here; notice the stylish and elegant shape of the Diamond pips. The black card backs do mean that you can expect to see signs of wear more quickly than with white bordered cards, but that's a small price to pay for so much bling, especially since the black background helps make the hotstamped gold foil look all the more impressive. The card stock is described as "Fine European Stock", and springs very nicely, and the cards faro fine too. It has Gemaco's smooth Ivory finish, and the absence of embossing does mean that they won't fan evenly, and can also feel somewhat slippery with the foil. This isn't intended to be a deck you'd normally use for a serious game of cards, but it certainly is ideal for the time you want to make an instant statement of luxury, and to impress people with lots of gold bling! Once again Will Roya and PlayingCardDecks have churned out some creative custom decks. In this instance these decks aren't likely to have a universal appeal, but will especially be appreciated by select groups. 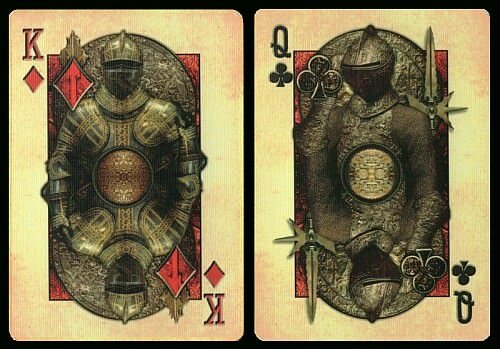 For example, the Monsters deck will be enjoyed particularly by those who are looking for something spooky or Halloween related, while the Knights deck will be a deck of choice for those who are intrigued by the medieval world of knights and armour. 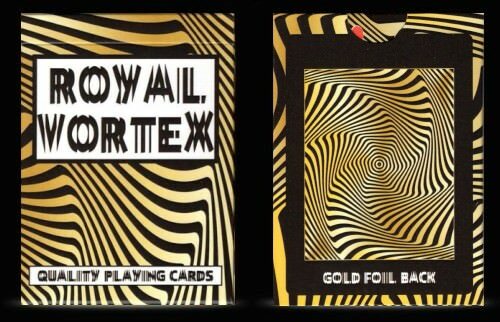 The Royal Vortex deck is a bit of an unusual beast, due to the classic faces on one side of the deck, and the exorbitant show of bling on the other - but certainly there are many who will find all that gold foil irresistible! 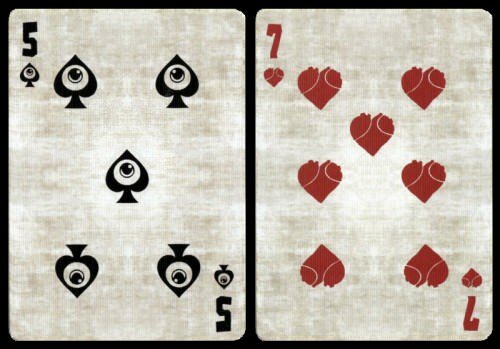 Will Roya has some more custom decks in the works, and I look forward to seeing what he produces next under the PlayingCardDecks.com banner!